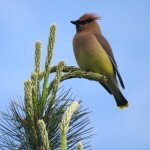 Cedar Waxwings are a staff favorite here at Dyken Pond. Their impressive aeronautics entertain both beginner and veteran birders alike. They can frequently be seen at Dustin Swamp feeding on the fruiting trees as well as the pond insects. Their silky coloring is unmistakable; they fade from a reddish-brown head to a blueish-gray on their wings and a yellow belly.